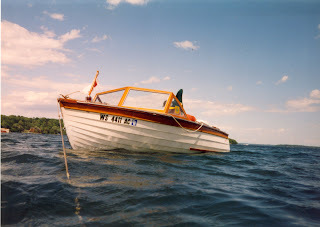 One of the hardest things to leave back in the Midwest was the Dragonfly, my 1957 Thompson Sea Coaster Deluxe wooden boat. I bought it back in 2004 from my friend Bill, who's grandpa bought it new and used it extensively at their Green Lake cottage (west of Sugarloaf). In 1959, he re-powered it and upped the HP from the original 25 to 35. Bill, Joe and I used the boat a few times each summer from 1989 thru about 1994. At the time it was stored at Bill's grandma's (later brother's) home in Berlin, WI. We christened it the "Aqua Fury", so named as the car that we towed it with was Bill's grandma's 1977 Plymouth Fury. The copper Fury only had 14k miles on it. I towed it once with my 1988 Subaru Justy, but ended up damaging the transmission, replacing it a few weeks later. Bill ended up moving to the Bay Area in the mid-90s. At that point, the boat had another nice hibernation. Fast forward to 2004. Bill's brother Tom was selling the detached garage where the boat was collecting dust and had to get the boat out. 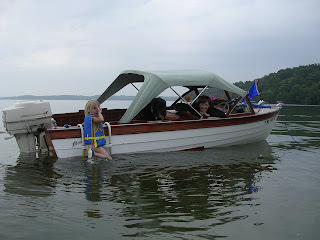 Since we had moved to Wisconsin about six months prior, the timing was perfect for us to have our turn with the boat. Allie was hesitant at the idea of having a boat. She didn't grow up around boats like I did and didn't see the appeal. But I was insitant so I took a trip up to retrieve it in April '04. I think she was also a little let down when she first laid eyes on it. Covered in dust as it hadn't been used in about seven years, it looked pretty sorry. I re-christened her the Dragonfly for this stage of the boat's life. The missing coctail flag was replaced with a Wisconsin state flag and a few minor maintenance items were taken care of. Surprisingly the boat fired right up once I put a fresh battery in. Amazing considering the gas was seven years old and the carbs still had old fuel in the floats. 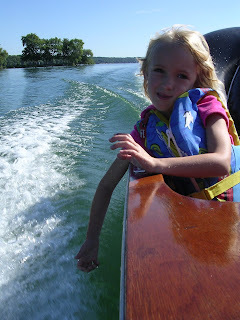 Boating quickly became a favorite summer pasttime for us. Living about 4 blocks from Lake Monona and having a boat launch in our neighborhood made it super easy to launch the small craft for anything from day trips to after dinner cruises. Of course being the Green Lake freak that I am, we had to make at least one pilgramige to Green Lake every summer. GL is only an easy 75 mile drive from the Madison area. With Carlsbad being our next destination, I knew I'd have to sell the boat this summer. Bill was contacted first as he and his wife had thought about moving back to the Midwest. He couldn't take it, so Joe was called. Thankfully he was able to buy it and keep it in the circle. 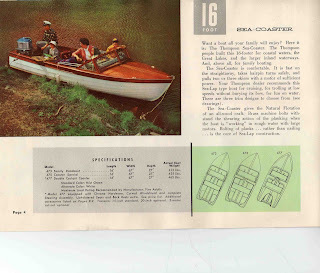 Now this boat was built by the Thompson Bros. Boat Company of Peshtigo, WI. 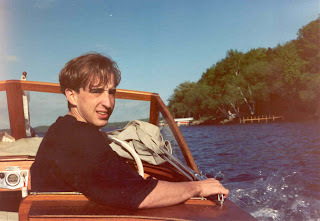 Until Joe's ownership, the boat had never left the great state of Wisconsin. We were afraid that something very bad would happen once it crossed the cheddar curtain. Siezed wheel bearings maybe? The good news is that Joe and his family have been enjoying it. 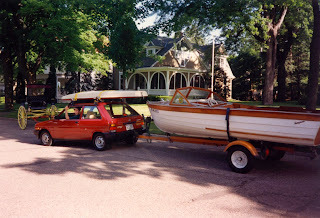 The boat now lives in Naperville, IL and has had a few excursions in the short time that Joe's owned it. He's even rigged up a rope for towing his kids on a tube. Dang, I shoulda done that! I never thought this boat would ever see Chicago or a Great Lake. I'm so glad the AF Dragonfly ended up in good hands. That thing is magic.